Last month we had 91 Pinterest accounts linked up! Can we reach over 100 for the month of February?? And I am happy to announce that starting March 1st I am offering a brand new ad spot to my sidebar that is ALL about the Pinterest love! My brand new A Pin-t ad spot is a 250x175 ad that runs for 30 days and includes organic pins to my Pinterest boards and/or group boards I belong to with Twitter amplification. This spot is perfect for the food blogger, the DIY blogger, the crafty blogger, not to mention small shop owners! Pinterest has been the #1 driver of traffic to my blog for the past FOUR months. And with over 3300 Pinterest followers and counting, you can be sure that your blog or shop is going to get tons of exposure with Frugal Foodie Mama. Best thing about this ad spot? The price! Just $6 for 30 days, but for the week of the Let Me Pintroduce You Party you can get it for just $5! Just visit my Sponsor Page here, click to purchase the Pin-t ad spot, & use promo code pinning at check out to get your discount! :) I will only be offering 6 of these spots each month, so go grab your's for March before they are all reserved! 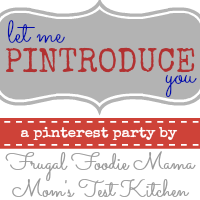 Please follow me (Frugal Foodie Mama) and Jaime (Mom's Test Kitchen), and this month's co-hosts Rosie (Rosie Quinn) and Lisa (Paintbrush & Screwdriver) on Pinterest. Thanks for hosting, ladies! Can't believe it's already been a month since the first party!